In Daniel Clowes' 2004 comic book The Death-Ray, a totally average 1970s high-schooler named Andy discovers that he gains super-strength whenever he puffs a cigarette. This revelation leads Andy on a vigilante quest filled with beer, high-tech weaponry, and poor decisions. 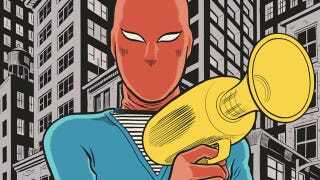 With The Death-Ray coming out as a graphic novel next week, io9 spoke with Clowes about superheroing with no adult supervision. Most people tend to associate your comic output with books like Ghost World or Wilson. Why a superhero book? It's complicated. For years, I felt like the way I explained my work — as opposed to the mainstream comics — was to say, "Mainstream comics are about superheroes, my work is about other stuff. You know, the opposite of superheroes!" It's like I was always describing my work as part of the whole field that I come from, people like the Hernandez Bros. and Chris Ware. After a while, it was nagging at me that that wasn't really true. That was just a really easy way to explain it to people. It's actually something more to do with the approach taken and frame of reference myself and other artists are using. I always felt like I was propagating this lie that somehow that was the only difference. Somehow it propelled me into one day wanting to do a superhero comic just be able to throw that theory out the window. Is there anything autobiographical about Andy's travails in The Death-Ray? Yeah, young Andy looked a lot like I did at that age — back in the Seventies, when we all had bowl haircuts and wore stupid clothes, basically the same clothes that kids are wearing nowadays, which is always strange to see. When I do these comics, I try to create characters and make other people. I'm not thinking in terms of my own experience at all. The characters always seem very remote from my own life, but when I go back and re-read them years later, every single panel is filled with personal details I hadn't intended to put in there. I was just looking through The Death-Ray — all the high-school kids are based on kids that I went to high school with. But not really intentionally, I just remembered what these kids looked like unconsciously. They could almost sue me for representing them in such specific ways. Superhero origins tend to be incredibly dramatic. In The Death-Ray, Andy gains his powers when he smokes. It's such a wonderfully mundane origin. It was something of a metaphor. It seemed like something that an adolescent would think of, something that makes one an adult. Those of who are looking back at that vantage point can see that it's actually the opposite. Kids who grew up reading comics always imagine, "What would we do if we had superpowers?" We imagine secret identities and girlfriends like Lois Lane that we would rescue, but reality is much more complicated. I certainly don't trust anyone I know with that kind of power. I was mugged recently, so I really enjoy how the book portrays vigilante justice. The Death-Ray really nails the realities of vigilantism — it's pretty impractical. I'm sorry to hear that. Geez! As a kid, I had a dangerous walk to school. I was punched in the stomach many times, I had my bike stolen. It was a very tense daily ritual I had to go through, and I developed some kind of fantasy about a weapon that would protect me. Was this a different character than The Death-Ray? I sort of invented The Death-Ray under a different name when I was about 16. I was going to try my own superhero comic. I got as far as drawing the cover 500 times and never drew anything inside. But I had the whole story figured out. It has some similarities to this character. He had a ray gun and lived with his grandfather. It was basically a total rip-off of Spider-Man where the grandfather gets killed and he seeks revenge. To my credit, I never actually drew it until I was too old to know better. The Death-Ray has a fantastically retro costume. Ever see any D.R. cosplayers? There was a guy online who made a Death-Ray costume with all of the different steps. He looked pretty good — the whole homemade costume and schlubby guy in a wrinkled suit look that so many of my characters have. It was pretty impressive. There have been a few others, but it's a small field. Any updates on how the movie adaptation of The Death-Ray is going? It's one of those projects that we've been working in our spare time for a couple years. It's very much a living project — it's still ongoing. I've just written a new draft for it. It's a very different version of the character. When I originally did the comic, I was going to do half of the book about the teenage Andy and half of the book about the middle-aged Andy. It didn't cohere as a story, so I picked the teenage side. But when I was finished, I missed all the stuff about the older Andy, so the screenplay is the end version of the comic. The teenage part is much smaller in proportion. So, what else is cooking? I've also been working on the first draft of the Wilson movie for Alexander Payne, and everybody seemed to like that. I'm also working on a graphic novel that I'm not going to talk about for another year. I also just finished a monograph of my artwork that has my entire career shrunk down to 220 pages, but that's coming out next year. There's going to be a traveling museum show that begins at the Oakland Museum in April 2012. Final question — do you have any cans of OK Soda still lying around? I actually only have one can after all these years! It was getting all dented and looking like it's filled with botulism. My dad died a few years ago and I was cleaning out his workshop. I found this old trash bag, and I decided to look in it. It was filled with OK Soda cans! Now I have 12 of them. I had no idea he actually knew about it. It's rather strange. The hardcover reprint of The Death-Ray hits stores October 11 from Drawn & Quarterly. You can read a preview of it here.